A few years ago, while walking along the section of the Lantau Trail close to Pui O, I was approached by a bunch of college age folks who asked me how far it was to the Chi Ma Wan Peninsula. Guessing correctly that none of them had a map with them, I took out my Countryside Map for Hong Kong's largest island and showed them where we were as well as where the Chi Ma Wan Peninsula was on it. In addition, after ascertaining that they were thinking of venturing along the Chi Ma Wan Country Trail, I showed them where it was and got them realizing that it's 18.5 kilometers long -- whereupon they decided to abandon their hiking plans for the day on ths spot! Based on how few people I see whenever I've been on this southeastern section of Lantau (be it to hike or take part in beach clean-ups), I'm inclined to conclude that the length of that official trail puts many a hiker off in addition to its out of the way location. In either case, it's a real pity; not least because this part of Hong Kong really is pretty scenic, and there also being ways to break up the hiking routes so that one doesn't have to go along all 18.5 kilometers of the Chi Ma Wan Country Trail in one go! As an example: the section of that trail which passes through an area known as "rock wonder" can be accessed without having to go up the highest points of the peninsula. Also, the Inter-Islands Ferry between Mui Wo and Cheung Chau makes regular (though not frequent) stops at a pier on Chi Ma Wan. So if you get your timing right, you can take that ferry back to civilization (as I've done more than once now), the trail head, or both! Three years ago today, the Hong Kong police fired 87 cannisters of tear gas into a crowd of peaceful protesters assembled at Admiralty and effectively triggered the start of the Umbrella Movement. Two days previously, the then-18-year-old Joshua Wong and a number of other pro-democracy activists had scaled the fence that had been erected around a previously open space in front of the East Wing of Hong Kong's Central Government Office Complex to try to reclaim that which had previously been open to the public and, for their troubles, been put under arrest. Pretty much every time I pass by -- and look through the still existing fence at -- Civic Square, I get to thinking how small that space is relative to the amount of space that consequently was "Occupied" by protesters for 79 days in the latter part of 2014. I also get to reckoning that if that open space had remained open to the public in September 2014 (the way it had been originally set up to be), quite a bit of trouble could have been averted. Put another way: I honestly believe that much of the anger and negativity that many of the Hong Kongers who ended up taking part in the Occupy (Hong Kong) protests -- that spread beyond Central and Admiralty to Causeway Bay and over Victoria Harbour to the Kowloon Peninsula -- felt with regards to the territory's government and police were the result of their overly strenuous efforts to clamp down on what actually had been non-violent acts of civil disobedience. Three years on, you'd think that Hong Kong's powers-that-be and their overlords in Beijing would have realized by now that the more they try to push Hong Kongers to not act, the more they'll (re-)act. But, alas, that's not the case. What may be an even greater tragedy is that a not insignificant number of individuals who didn't dare -- as opposed to just didn't want -- to venture into the Occupy areas to see and hear things for themselves have never realized that the very best of Hong Kong was out there. To this day, I feel that the Umbrella Movement taught and showed me that there's a tremendous lot of good in Hong Kong; which is why I actually remain hopeful that "Hong Kong, the freest part on Chinese soil with the strongest faith in democracy, can still make a difference", and convinced that there's a lot of life and fight still left in those who may currently feel down but most certainly should not yet be considered out for the count. Being the long time Hong Kong film fan that I am, I first saw -- and was highly impressed by -- the lead actress of Ho Yuhang's Mrs K in late 1970s and early 1980s Shaw Brothers kung fu classics such as My Young Auntie (for which she was honored with her first Best Actress accolade at the Hong Kong Film Awards) and Legendary Weapons of China. So imagine my surprise after returning to Asia on July 4th, 2003, to find that Kara Hui Ying Hung was looked upon as primarily a TV actress rather than a movie luminary at that point in time; and that when she did occasionally appear in a movie (e.g., Infernal Affairs II (2003) and Crazy N the City (2005)), it was mainly in supporting rather than starring roles. In 2009, however the actress now more often credited as Kara Wai burst back into the limelight with another Hong Kong Film Award Best Actress-winning performance in At the End of Daybreak, and revealed that she still could be a ferocious action star in Peter Chan Ho Sun's intense Wu Xia two years later. Now, after garnering a third Hong Kong Film Award Best Actress prize (with last year's Happiness), she's reunited with the Malaysian director of At the End of Daybreak and has an anchoring role in a film that looks to have been tailor-made for this actress who's shown over some three and a half decades that she possesses considerable dramatic and action chops. Mrs K (Kara Wai) is the wife of a doctor (Taiwanese rock star Wu Bai) and mother of a taekwondo-practicing teenager (Malaysian newcomer Siow Li Xuan) who the movie's audience first sees at home in the kitchen. Within minutes, however, the lady shows that she's not one to be trifled with when she comfortably deals with two young men whose gambling debts have got them attempting their first ever robbery. And so easily did she turn the tables on those two fellows that you just know that she's got the kind of troubled past that will threaten to haunt her at some point. One afternoon, while the happy family are hosting a barbecue at their home, a Macanese man (Tony Lau Wing) claiming to be an old friend of Mrs K turns up. A sleazy ex-cop seeking to blackmail her (with his knowledge of her participation in a Macao casino heist years ago), he doesn't realize that he's the hunted rather than hunter, and unwittingly leads one very angry, vengeful individual (Simon Yam) and his dangerous accomplice (Faizal Hussein) to the woman who years ago had very nearly killed him but, unfortunately for her -- and, especially, her three accomplices (directors Fruit Chan, Kirk Wong and Dain Iskandar Said) -- didn't. With a story like that, it's pretty much a given that Mrs K will possess a number of action scenes, many of which have its titular character in the thick of it. Especially when one considers that Kara Wai is now 57 years of age (and didn't have a stunt double for this film), the actress -- who looks to be in far better physical shape than many people 10 or even 15 years younger than her -- acquits herself tremendously well indeed; with credit also being due to action choreographer Adam Chan for staging fight (and chase) sequences that come across as realistic as well as gripping. At the same time though, those expecting an all-out actioner need to realize that Ho Yuhang is far more of an arthouse drama director than action movie helmer. So it is only to be expected that Mrs K will have a more languid pacing than might be expected along with quiet dramatic moments, dialogue-rich scenes and stylistic flights of fancy (some of which work better than others). Put another way: Mrs K does not serve up a straight-out adrenaline rush but, then, I sincerely doubt that it was meant to. What it definitely does, however, is be a great star vehicle for Kara Wai. When viewing the film, you'll be able to feel how much respect Ho Yuhang has for her -- and, through such as his general casting, how much of a love of Hong Kong movies (of yore) this Malaysian also has. Among the perks of being a Hong Kong Identity Card holder is your being able to go to Ocean Park for free on your birthday. And ever since I read about this some time back, I'd been meaning to take advantage of this offer -- and finally did so yesterday afternoon, the first time I've ever been to this Hong Kong theme park on my own (rather than along with family members or at least one friend, like had previously been the case)! Thanks to the MTR's South Island Line which opened late last year, getting to Ocean Park is far more of a breeze now than before; with the Ocean Park MTR station being literally just a few minutes' walk away from the park's entrance. Indeed, it was a greater hassle to travel between the Lowland and Highland sections of Ocean Park since: my ride on the Ocean Express train from what's also known as the Waterfront to the Summit involved spending several minutes in a claustrophically loud and crowded space (full of seriously uncouth Mainland Chinese tourists); and my cable car ride from one side of Nam Long Shan (Brick Hill) to another was preceded by a 25 minute wait in line for the privilege. On a previous visit to Ocean Park, I had discovered that roller coasters appear to be far less popular among Hong Kongers and Mainland Chinese folks (the latter of whom make up by far the largest percentage of visitors to this Hong Kong amusement park) than among American and British amusement park patrons. Consequently, I made a beeline for the two Ocean Park roller coaster rides I had yet to go on and which turned out to be located close to each other. The first of these -- the Arctic Blast (located in the Polar Adventure part of the park) -- proved to be the tamest of the four Ocean Park roller coasters I've now been on but acted as a good warm-up ride for that which is even wilder than the older The Dragon (which features a couple of 360 degree rotations) as well as the Mine Train (whose location on the edge of the hill adds to the thrills as well and stunning visuals) which I've ridden a few times before. Located on "Thrill Mountain", the Hair Raiser is Hong Kong's first floor-less rollercoaster and also its fastest (with speeds reaching 88 kilometers at hour at times) -- and capable of giving one quite the adrenaline rush! At various points of the summer's day, I tried out different ways of cooling down. Visits to the South Pole Spectacular (where penguins galore can be found), Arctic Fox Den (whose denizens are really adorable looking) and North Pole Encounter (whose walruses and seals got me recalling the aquarium I visited in Tromso, Norway, a couple of years ago) proved pretty pleasant. Unfortunately, that could not be said of my experiences at The Rapids, where encounters with seriously ill-mannered Mainland Chinese tourists who seem to think it perfectly okay to push, shove, cut queues, etcetera, got me all hot and bothered. As sad or bad as it may sound, I came away from my Ocean Park experience feeling far more positive about the Chinese pandas, Sichuan golden snubbed-nose monkeys, Chinese sturgeons and even the oceanic predators at Shark Mystique attraction than the Mainland Chinese visitors to the amusement park. In all honesty, if I had to deal with them regularly, I think I'd end up having a major meltdown at the very least, and a nervous breakdown that'd see me running amok at worst! And truly, I feel for those Ocean Park frontline staffers who have to do so. More than incidentally: while I was on the Ocean Express, I saw the train driver having the kind of look on his face that left me filled with certainty that he wished he was far away from that noisy, enclosed space which he was in with hundreds of visitors, the vast majority of whom are on the boorish side and from north of the Hong Kong-Mainland China border. I wonder how long are the poor soul's shifts and have to think that he must surely be allowed a number of breaks. Otherwise, he and those other with his job surely can't last long in that post without going insane. And as it is, there seems little doubt that familiarity with their Mainland Chinese neighbors is bringing contempt, not understanding nor fellow feeling, in their case. A good time was had there by lots of people! After missing out on Asia's biggest craft beer festival last year (because I was out of town when it took place), I made sure to find out when Beertopia would be taking place this year. And as far back as July, I had secured an early bird ticket for the second day of this year's edition -- which I proceeded to put to good use yesterday. In statistical terms: I was at the beer fest from around 12.30pm to 7.30pm, during which I tried 10 different beers (more if you count the sample sips I took from friends' cups!) from eight different breweries and 1 elderflower cider. Also, thanks in parts to a friend who likes beer but has a really low alcohol tolerance level, I came by extra drinks coupons that I ended up using on two bottles of beer I opted to take home along with a complimentary can of a Weisse beer from Lithuania (rather than drain them all over at the festival ground)! This year's fest featured over 500 beers from 96 different breweries. Even so, I got the feeling that the 2017 edition was smaller in size than 2014 and 2015's. And I think it says something that, whereas in previous years, I "discovered" great beers that I hadn't previously known about, the beers I liked the most this time around were old favorites that I've had before. Something else that was quite apparent to me was that this year's Beertopia had a different atmosphere from the ones I previously attended. In particular, I felt that whereas the 2014 edition had been beer geek heaven, thanks in large part to a number of the brewers (including personal favorites over at Kagua and Boxing Cat) being present, and eminently available to talk to and even hang out with for a time, while this one was attended by people primarily out there to have a good time. Not that there's anything necessarily wrong with that, of course. But it speaks to a different emphasis (which includes providing space for smoking shisha) and a different type of crowd from previously, to my mind (as can be seen in there being a lot more people smoking cigarettes at the (outdoor) venue than I can recall for previous years and my smelling the whiff of marijuana about the place too). On the beer front: there was a lot more Hong Kong brewed products about the place too. In theory, this should be a good thing -- as one would expect local microbrews to be fresher than those shipped from elsewhere, often across oceans and from thousands of miles away. Unfortunately, I still haven't found a Hong Kong brewed beer that I truly love the way I do, say, California's North Coast Old Rasputin Imperial Stout, New Jersey's Flying Fish XPA, and Japan's Minoh Beer's W-IPA and stout. Still, I have continued trying out Hong Kong brewed beers at such as Beertopia. And this time around, the beers from local breweries (albeit ones that have partnered with foreign ones) that I tried were from HK Yau (brewed in Hong Kong with input from Brooklyn Brewery and Carlsberg! ), Heroes Beer, and Japanese Hitachino Nest Beer's Fotan brewery. What looks like a stained striped t-shirt but really is not! Until I went to the Hong Kong Science Museum earlier this week to check out its Eternal Life: Exploring Ancient Egypt special exhibition (which runs through to the 18th of next month), I had only ever been inside its lecture hall (which hosts Hong Kong International Film Festival screenings and also is a venue for a number of other special film screenings) and public toilet (usually before or after a film screening at its lecture hall!). One reason is because descriptions of its exhibitions tend to make them sound more geared for children than adults. In addition, this particular museological establishment is one of the most popular in Hong Kong, so my vision of it includes crowded, noisy exhibition halls. But whereas the areas of the museum where the temporary special exhibition about death and life in Ancient Egypt had been installed were indeed full of busy on the afternoon that I visited it, I guess I can at least count myself fortunate that the crowd actually wasn't as full of chatty and loud individuals as it could have been (especially given the young age of some of its visitors)! Given the superstitious fears that many Hong Kongers have, I was rather surprised that this particular exhibition appears to be so well attended (with a local friend who had been to see it earlier than me having described the exhibition area as being "as crowded as Mongkok")! Actually, I also was pretty taken aback to find that this particular exhibition that's jointly presented and organized by the British Museum and the Hong Kong Science Museum is an official event commemorating the 20th anniversary of Hong Kong's Handover to China by the British. To be sure, it's a bumper exhibition alright. But let's face it: even with its title emphasizing life, it really is about death -- with the visitors not only being surrounded while in the display areas by artifacts associated with people who are very much dead but also were found in their tombs and such! Put another way: it does seem much less a celebration of life per se than an examination of how people (who lived thousands of year ago as well as thousands of miles away) dealt with death and the dead. Furthermore, among the artefacts -- and, indeed, the exhibition's highlighted items -- are six mummies of deceased individuals who may have died as well as lived between 3,000 and 1,800 years ago but still are as human as you and I. And if one somehow managed to be unaware that this was indeed the case, numerous digital visualizations appear on various screens in the exhibition areas of those mummies' skeletons and such, complete with identified pathological conditions. The point about our common humanity particularly struck home when I found myself gazing at a piece of clothing that looked like a stained striped t-shirt. It turns out that it's a striped tunic from the Coptic Period and more than a 1,000 years old. But I really could very easily imagine it being worn by a young boy (or girl) living today! One gray day some time ago, two friends and I went on a Shing Mun Valley hike that took us around the main Shing Mun Reservoir. Since the route is circular and also pretty obvious, in that one's going along the banks of the reservoir, quite a few people decided to go on it without carrying a map with them -- only to realize that they had no idea of how far they had gone and had left to go, and end up doing such as asking passersby who actually had bothered to carry maps with them (like yours truly) for directions and, in the case of one couple who looked so pathetic and exhausted, being given water and food by charitable souls (like one of my hiking buddies)! As I was walking by Victoria Park's Model Boat Pool a few weeks ago, I got to wondering whether, in this era where hobby drones look to have become the remote-controlled toys of choice, that particular park facility -- which, at 954 square meters in size, is several times larger than the average Hong Kong apartment -- was still actually being utilized. So of course the next time I passed by there, I discovered not just one fellow but two guys (who probably are some 40 years apart in age, and didn't act like they knew each other) remotely manoeuvering their model boats at considerable speed through the waters of that model boat pool! Probably because of the considerable noise those model boats made as they roared around, the toys and their owners had attracted quite a crowd of onlookers. And while it can seem on the strange side for people to be so transfixed by this, I must admit to finding it all quite hypnotic myself too after I stopped to survey the scene and got to fixating on watching the boats racing round and round the pool! In contrast, whenever I've come across people with remote-controlled cars and trucks, it tends to be the hobbyists who attract me more than their toys. Sometimes content to be on their own, there also are others among them who prefer to meet up and indulge in their passions with like-minded folks: who range in age from young fellows who look like they're still in secondary school all the way to white-haired retiree-types; but who, without exception thus far, have uniformly been of the male persuasion! While taking an American visitor around Central a few months back, I was asked whether there are any Muslims in Hong Kong. If that fellow had stayed in a hotel in Tsim Sha Tsui (like many of his fellow tourists), chances are higher that he'd have known that this is indeed the case since one of that area's most prominent landmarks is the largest of the Big Lychee's six mosques. Situated next to Kowloon Park over on Nathan Road, Kowloon Masjid (AKA Kowloon Mosque) opened for prayers on Friday, May 11, 1984. Replacing an older mosque on the Kowloon Peninsula that had been a place of Muslim worship for over 80 years before it was demolished, this newer, larger structure also houses an Islamic Centre and its facilities include separate madrasah for boys and girls, three prayer halls (which can accomodate a total of 3,500 worshippers at a time), a kitchen, offices for its staff and a community hall. For a few hours this afternoon, the lower two floors of the Kowloon Masjid were made accessible to the non-Muslims as well as Muslims alike. On the ground floor (in British English but first floor in American English), things were on the festive side this Open Day. To be sure, the central area was given to a speaker delivering a talk about Islam in Cantonese and exhibits on such as "The Books of Allah", "Pillars of Islam", "Articles of Faith" and "25 Prophets of Allah Mentioned in the Quran". But there also were rooms where women could try wearing hijab and men could put on Arabic attire, and corners where people could sample halal food and get their names written out in Arabic calligraphy. On the first floor (in British English but second floor in American English) can be found the mosque's main prayer hall. I must admit to being surprised to be assured, when I asked, that I was free to go check it out and that I wouldn't need to put on a gown or veil in order to go in. And I also appreciated being informed that the Arabic writing at the prayer hall's entrance spells out the Islamic greeting of Assalamu Alaikum (which translates into English as "Peace Be With You". Inside the prayer hall, I saw a man praying and other men sitting about, individually and in groups. I also noticed a sign asking people to not sleep in the space -- and I suppose that might be tempting to some because the carpet that covers the entire floor is really nice and soft and, despite my suspecting that the prayer hall isn't air-conditioned, it actually felt airy and cool in the high ceilinged space. For all of its size, this prayer hall may well have been the most modest-looking of all the mosques I've been into (which thus far have been limited to ones in Istanbul -- whose Blue Mosque, Hagia Sophia and Suleymaniye Mosque really can take the breath away with their beauty and grandeur -- and Malaysia, including the royal mosque in Kuala Kangsar). At the same time though, I felt a serenity about the place that was really comfortable and comforting -- and imagine that Kowloon Masjid is a mosque that Muslims in Hong Kong are happy to visit, worship in, and can feel at ease. After Yasmin Ahmad passed away in July 2009, at the age of just 51 years, and while in the prime of her filmmaking career, I expected her friend, Ho Yuhang (who had served as the assistant director for her debut-making Rabun (aka My Failing Eyesight) and guest starred in that film and Mukhsin), to take up her mantle: not in terms of producing quality Malaysian movies but also films that felt truly Malaysian. While he has done the former, there's a better case -- with bi-cultural romance The Journey (2014) and now the multi-cultural, multi-lingual Ola Bola -- to be made for Chiu Keng Guan being Yasmin's true spiritual successor. A nostalgic sports movie inspired by the 1980 Malaysian national football team, its main characters are not named Soh Chin Aun, R. Aramugam, James Wong, etcetera -- but they share enough identifying traits with those Malaysian sports legends to enable those of us who are familiar with these footballing personalities to easily figure out who's modelled after whom. Largely set in an era when the Malaysian national team were able to beat the likes of South Korea (in competitive matches!) and Arsenal (albeit in just a friendly game but, frankly, unthinkable these days), it's bookended by contemporary scenes featuring young but ambitious TV journalist (Marianne Tan) getting tasked by her boss to do a story about a team of unlikely heroes seeking Olympic glory. 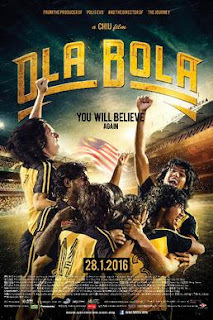 Beautifully lensed (by Chin Tin Chang) and well edited (by Gwyneth Lee), Ola Bola's footballing scenes -- particular those pertaining to the climactic football match -- are the absolute highlights of this pretty entertaining show. At the same time, it's clear right from the start that director Chiu Keng Guan had greater ambitions for his film, which possesses strong pedagogic and serious dramatic elements along with ample sporting action and comedic hijinks. "You will believe again" was the campaign tagline for the movie. Even if unspoken, it's pretty obvious that there's an advancing of the idea that "unity is strength" (bersekutu bertambah mutu, as per Malaysia's national motto) -- for the country, on the football pitch and also in life. And in retrospect, it's amazing that there could be formed a band of brothers -- supported and cheered on by female and male family members -- whose representatives included members of the country's three largest ethnic groups and from states in both East as well as West Malaysia. Tan Pik Yee and Chan Yoke Yeng's script can be clunky at times but even while my head was shaking over how overly melo-dramatic and tugging at the patriotic heartstrings some sections of it was, I found my heart threatening to burst and my eyes welling up with tears. The stories of the likes of hot-headed captain in Chow Kwok Keung (J.C. Chee) -- so dedicated to his national team (and his dream) that he turned down a move to play for a professional club in England -- and goalkeeper Muthu Kumar (Saran Kumar) -- who clashes heads with his father when he effectively prioritizes football and country over livelihood and family -- can sometimes seem exaggerated, and yet they feel like they contain enough truth to resonate. Also, in view of it being an impossible "ask" to provide three-dimensional portraits of all of the members of the team, it's truly to the filmmakers' credit that one comes away with distinct impressions of a number of the players: including Eric from Sabah (Eric Teng), the talented -- but also hard-working -- Ali (Luqman Hafidz) and even seemingly perennial benchwarmer Chai (Lim Jiang Wen). And on an aesthetic note: his Sanjeet Singh character may not have had all that many lines but Haris Zainuddin definitely left an impression by way of his good looks! When hiking in Hong Kong, it's a fairly common occurrence to catch sight of -- and even have to cross -- a hill stream or more. On the other hand, it's not usual to find oneself walking along the banks of an actual river as well as crossing over it; this not least because there are way fewer actual rivers in Hong Kong than small streams, many of which are not considered significant enough to be named. On my most recent bike ride here in the Big Lychee though, I found myself cycling on the banks of not one but two Hong Kong rivers! Having got on my (rented) bicycle just outside Tai Po Market MTR station, I found myself riding for a bit along the Lam Tsuen River which flows through Tai Po town from the northern slopes of Tai Mo Shan (Hong Kong's highest mountain) down into Tolo Harbour. And on the home stretch of the approximately 15 kilometer length bike ride, I was cycling on one side of the Shing Mun River Channel (which was artificially reclaimed from the shallow sea and enables the Shing Mun River to flow into Sha Tin Hoi, a cove which opens into Tolo Harbour). While biking along the Lam Tsuen River, I got to thinking that the scenery I was passing was distinctively New Territories; in that even though Tai Po is a large town, there still is a rural feel to it. This is a place, after all, where egrets are familiar sights along its river banks and also feel comfortable doing such as perching on the roof of a boat moored in the river! In contrast, parts of Sha Tin -- which, in reality, is a New Town in the New Territories, like Tai Po -- that I passed through on the same bicycle ride felt like it had culturally become part of Mainland China. For starters, there's a bridge there which looks like it came out of a Chinese painting. Then there's a floating restaurant housed in a structure that brought to (my) mind the Beijing Summer Palace's Marble Boat! On my most recent trip back to Penang this past July, I met up with a childhood friend with whom I had spent many happy times. At one point, we got to regaling her son with stories of how we liked to bike up a nearby hill; or, rather, gritted our teeth and rode up the hill in order that we could ride down it as fast as we could! As an adult, however, the thought of riding up steep hills seems too much of a challenge -- or, at least, bother. Which is probably why it was years before I decided to take my first ever bicycle ride in Hong Kong. In all honesty though, I've enjoyed myself tremendously each time I've gone biking in the Big Lychee; even on outings when the weather has been less than perfect and I ended up getting rained on. And despite Hong Kong having more than its fair share of hills, the (officially designated) bike paths I've been on (all of which are in the New Territories) have actually all been on the flat side as well as paved. Of course if I wanted to go bicycling on more hilly terrain, there are a number of places that I can do so, including in some of Hong Kong's country parks. If truth be told though, I reckon some of those trails designated for mountain bike riding are on the dangerous -- if not downright insane -- side. I think here of the mountain bike paths along the Dragon's Back and Chi Ma Wan Peninsula: both of which I think are far more suitable for hiking than biking, especially since there are sections where if you veer off to the side, it will result in a pretty sheer drop down a high hill -- and, in the case of the latter, possibly down into the sea too! One of the prettiest chopstick holders I've ever seen! Thanks to Daimaru (Hong Kong's first Japanese department store, and the chain's first overseas branch), Matsuzakaya, Mitsukoshi and Sogo having established branches in the area, Hong Kongers have long associated Causeway Bay with things Japan. These days, however, the focus tends to be Japanese food, with eateries specializing in fare from the Land of the Rising Sun abounding in the area. Among the newest of them (open just some two and half months today) is Sushi Tsubomi. Not your average sushi-ya, it's also not your traditional sushi-ya; as one can probably tell from its executive chef (Michael Chan, a native Hong Konger) having formerly worked at Nobu and being known for making "creative sushi". In addition, the restaurant's interior design is unlike any (other) high-end sushi-ya I've ever been to -- which has been as intimate in feel as this one is large and airy. Thanks to my being the first customer of the day, I did get served by Michael -- who also prepared the sashimi platter I ordered (instead of my more usual sushi). An aesthetic delight, it contained more than the eight different kinds of sashimi it was supposed to; with hamachi (yellowtail), kohada (gizzard shad), seared isaki (striped pigfish), uni (sea urchin), botan ebi (Botan shrimp), akami (regular tuna) and what looked like chuu-toro (medium fatty tuna) but tasted like fine o-toro (fatty tuna) in the mix. When he served me the sashimi, Michael informed that all the seafood served came from Japan, and that he wished the fish were fattier than is normally the case this time of the year. In retrospect, I wonder if he was effectively apologizing (or just plain letting me know in advance) that the sashimi would not be as delicious tasting as it was good looking -- because, if truth be told, that's what I found to be the case (with the notable exception of the pieces of toro). Don't get me wrong: my sashimi lunch at Sushi Tsubomi wasn't at all bad. But I also didn't experience any moments of ecstacy, even while eating the uni and, yes, the toro too. And yes, the raw seafood did indeed taste fresh -- but, in this case, it may have all been too fresh; since true master sushi chefs are known to age (some of) their offerings for a few days to get the particular taste and texture that they want. These kind of thoughts get me wondering: have I passed into the realm of sushi snob? And this also since, upon my seeing a few guests being ushered into what appeared to be the restaurant's private room, I got to wondering who would want to sit and eat there -- rather than directly in front of the sushi chef (and preferably the most senior one in the establishment)?! It's strange: by the standards of many people, Sushi Tsubomi would be a high-end dining establishment. With great views out of the 22nd floor restaurant's windows and an overall decor that seems to scream out that it's expensive, it's definitely not lacking bling. For me though, there are tell-tale signs that it's not quite up there in the dining stakes. For one thing, size matters -- but in the case of high-end sushi-ya, it's usually the case that small is better. In addition, while the availability of a private room and a drinks menu whose sake/nihonshu section only consists of junmai daiginjo may impress some people, those elements indicate to me that this restaurant is not actually targetting true lovers of sushi and sashimi. In short: Sushi Tsubomi may wow some people but it actually doesn't do it for me. Bits of offal that I find delicious!